Arrive in Munich: You’ll be greeted by our staff at the airport and shuttled to your hotel for check-in. Orientation: Your hotel is located in a super convenient and bustling part of Munich. We’ll walk you around the area so you can check out the Theresienwiese, Marienplatz, and other great sites. Bavarian Welcome Dinner: Join us for a hearty Bavarian meal at a traditional restaurant or local beer garden. You’ll get to know your fellow Bucket List Travelers. Don’t drink too much! This is a trip you’ll want to remember forever. Buffet Breakfast: Enjoy a complimentary breakfast in your hotel. Neuschwanstein Castle Trip: Spend the day at the world-famous Neuschwanstein Castle in the Bavarian countryside, one of Europe’s most famous castles. We’ll organize everything from transportation to tours. 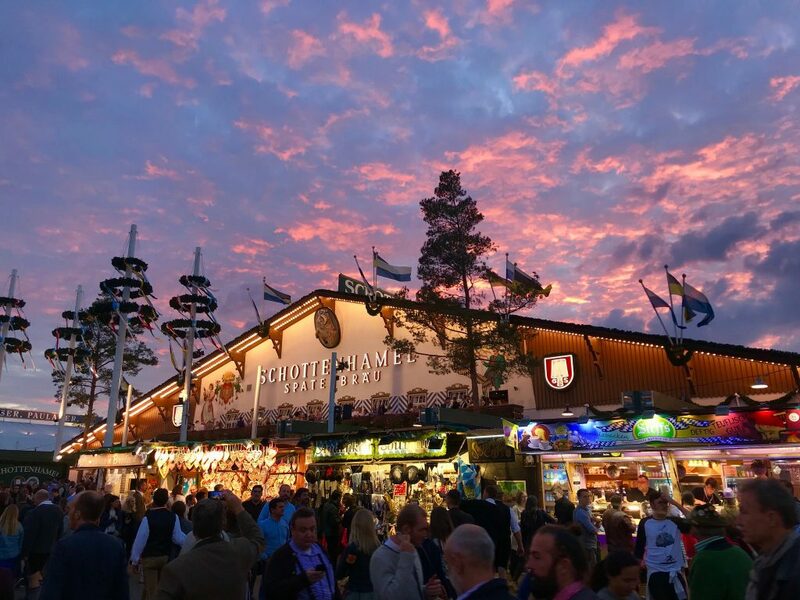 Free Evening at Oktoberfest: Go explore the festival grounds! From the carnival rides to the amazing food, you’ll find plenty to keep you entertained. Bike Tour: In four hours, you’ll enjoy the beautiful fall weather and all of Munich’s most famous sites on this leisurely bike tour. Afternoon on the Town: Spend the afternoon in downtown Munich, exploring the many shops, museums, and parks that the city has to offer. Beer Tent Reservation: We’ve got a beer tent seat with your name on it. We’ll get you inside one of Oktoberfest’s largest beer tents for live music, merry-making, and (of course) beer! Your reservation includes two beers and a meal. Say Your Goodbyes: Make one last visit to the festival grounds, buy any last minute souvenirs, and swap contact info with your new friends. Airport Transfers: We’ll organize private transportation for you back to the airport. Auf Wiedersehen! Munich is the bustling metropolitan center of Bavaria. Truly European in every sense of the word, Munich is a mix of culture, art and history. 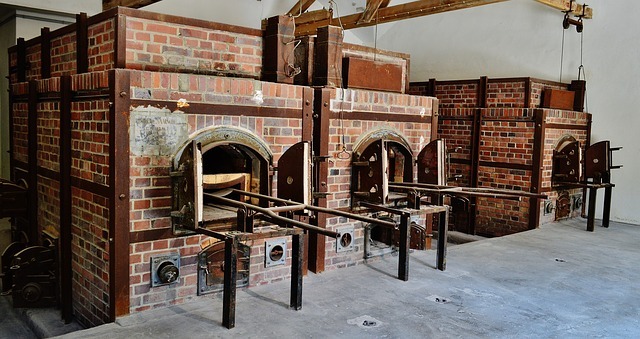 You’ll find more museums here than in any other German city. 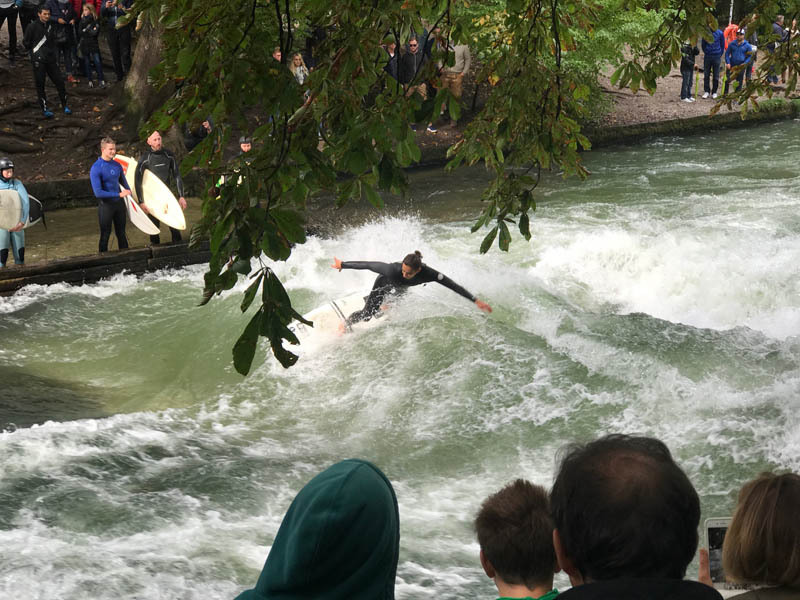 There are endless things to do in Munich, from joining an informative walking or bicycle tour, to strolling through the beautiful English Gardens, discovering its amazing museums and art, to wandering through the pedestrian streets around Marienplatz, or enjoying one of Bavaria’s favorite pastimes-relaxing in a beer hall or garden. On a lighter note, Munich has an ideal geographic position for fascinating day trips. There are plenty of German castles and palaces in and near Munich. 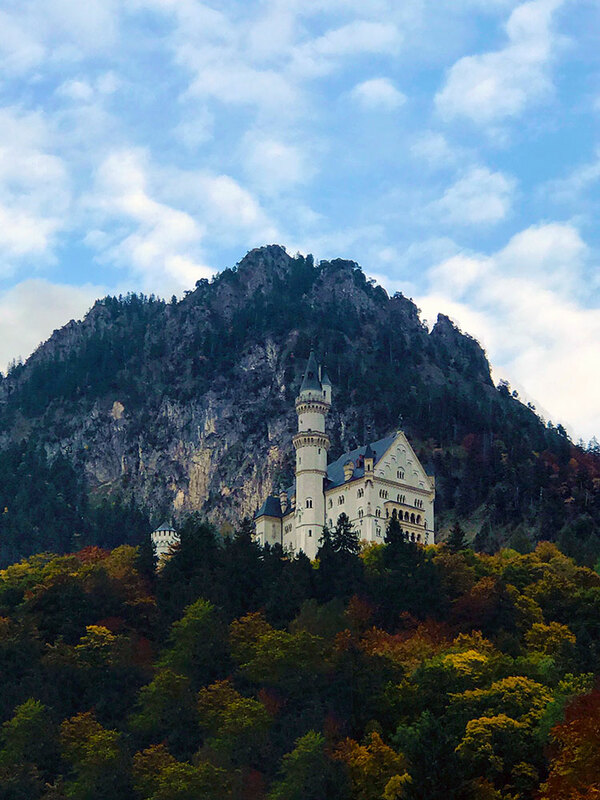 You can take a short train ride and be in the heart of the Alps where you’ll see King Ludwig’s indescribable Neuschwanstein Castle (which Disney used to modeled their famous fairy tale castle) or to the Andechs Kloster (monastery) in the countryside just outside Munich. If you need more, head a bit farther north and visit medieval villages along the “Romantic Road” such as picturesque Rothenburg. Bavaria is predominantly Roman Catholic, and there are several beautifully adorned Baroque and Rococo churches throughout the region and throughout the city of Munich. Finally, with the mountains nearby, depending on the weather, you can take a late summer hike or an early season trip to the slopes. 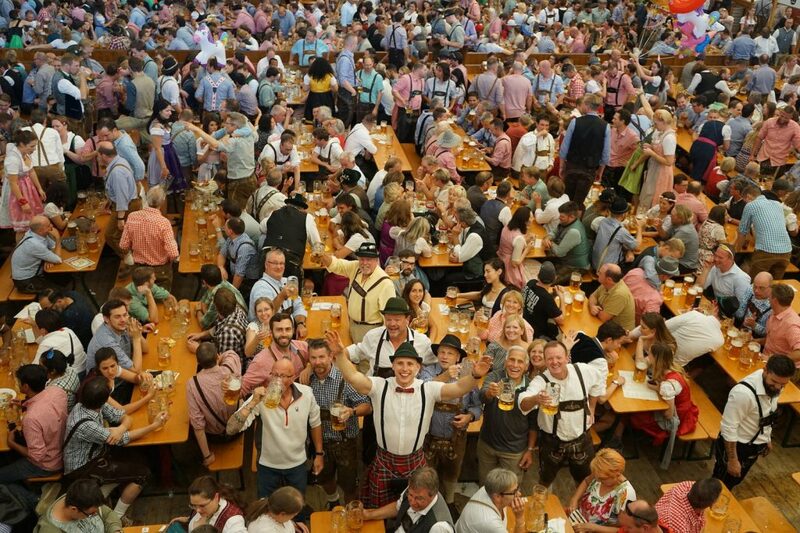 Naturally, you can participate in the largest beer festival in the world, too! Oktoberfest is about more than drinking beer, however. 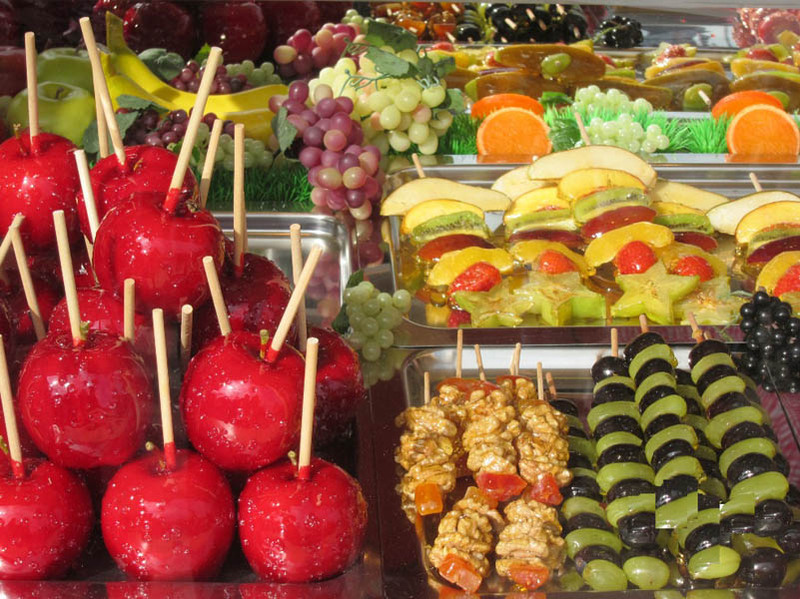 It’s a cultural celebration for the whole family that includes carnival rides and food booths filled with Bavarian fare like sausages, rotisserie chicken, giant pretzels, gingerbread cookies, sugar-coated nuts and candied apples – yum! With flat roads and dedicated bike lanes, Munich is best seen on two wheels. It’s the best of both worlds, as you can get up close and intimate with your surroundings as if you were walking, while also covering more ground like you could on a bus (or Segway). While sometimes skeptical at first, almost everyone loves the bike tour by the end. The breezy carefree riding through the English Garden and cobblestone alleyways of Munich is a magical experience. All the while, your guide gives you historical and present-day stories of the surroundings. On a scale of 1 to 10, with 10 being really intense, this is a 2. If you can ride a bike, you can do the bike tour. The oft-repeated phrase is “if you can ride a bike, you can do the bike tour.” On the flip side, you must be able to ride a bike in order to do the tour. With the help of our friends at the award winning Mike’s Bike Tours, the four hours spent on two wheels is often the favorite experience among our guests. 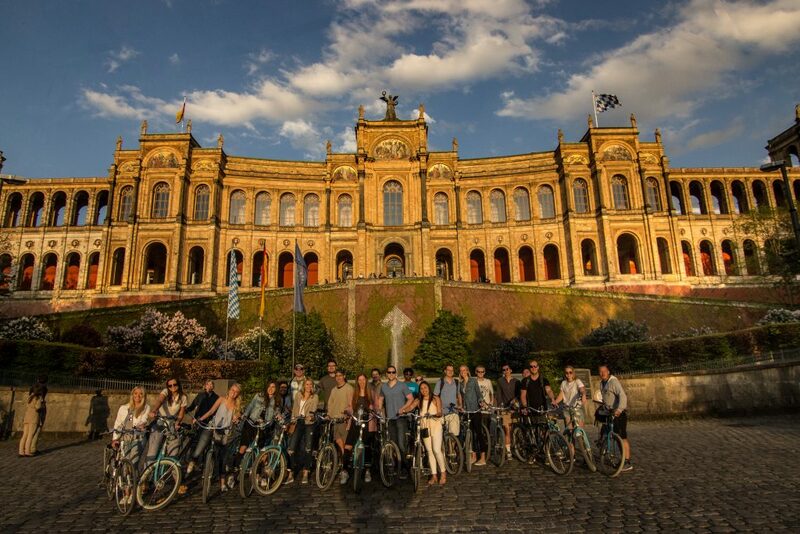 It covers the majority of Munich’s sightseeing highlights, including the beautiful Peace Angel monument, the Maximilianeum (the Bavarian Parliament building), the Volksbad, Lukas Kirche and the Deutsches Museum. A secret stop on the bike tour. There is also a pleasant stop in the famous English Gardens for a hearty lunch and beer. It’s a wonderful way to spend and afternoon! The castle as seen from Marie’s Bridge, or Pöllatbrücke. 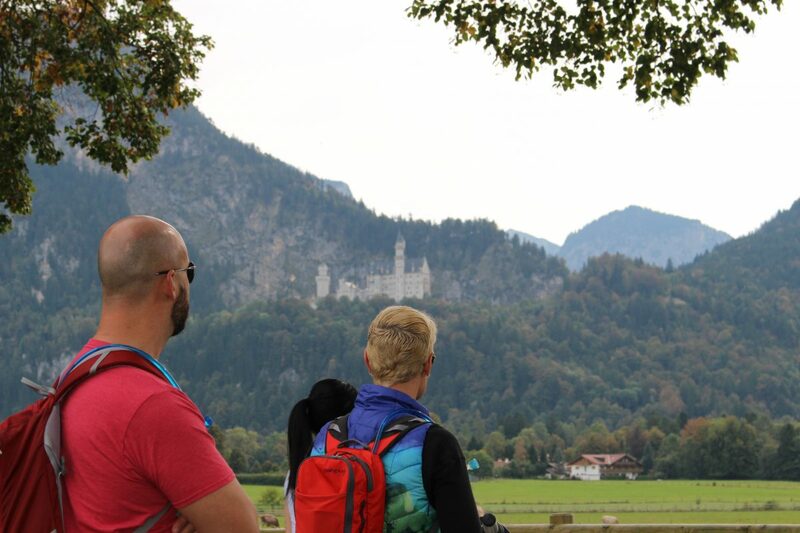 A trip to the Neuschwanstein Castle is among the most popular destinations in all of Germany. 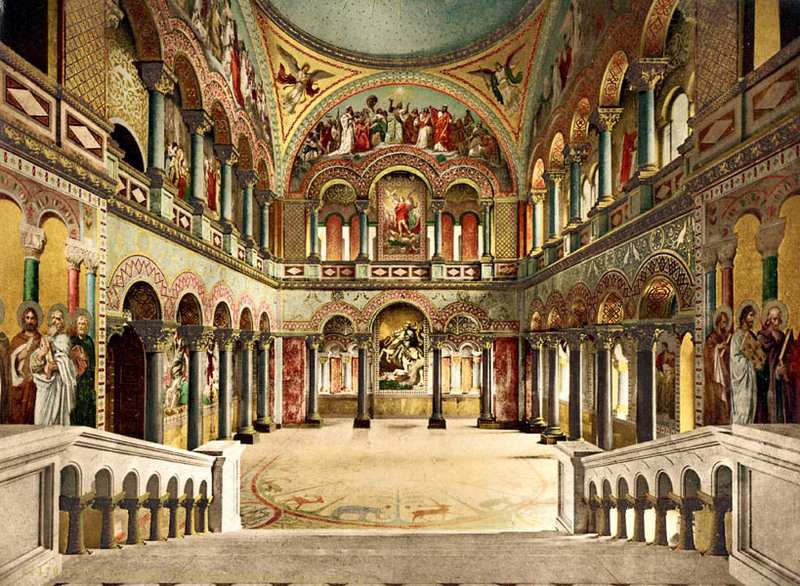 Built by King Ludwig II of Bavaria, the “mad king”, it was created out of pure fantasy dreamed up by the young king. A relatively young castle built in the mid-1800s, it was built in the Romanesque Revival style as an homage to Richard Wagner. Disneyland’s Sleeping Beauty castle was modeled after Neuschwanstein Castle. 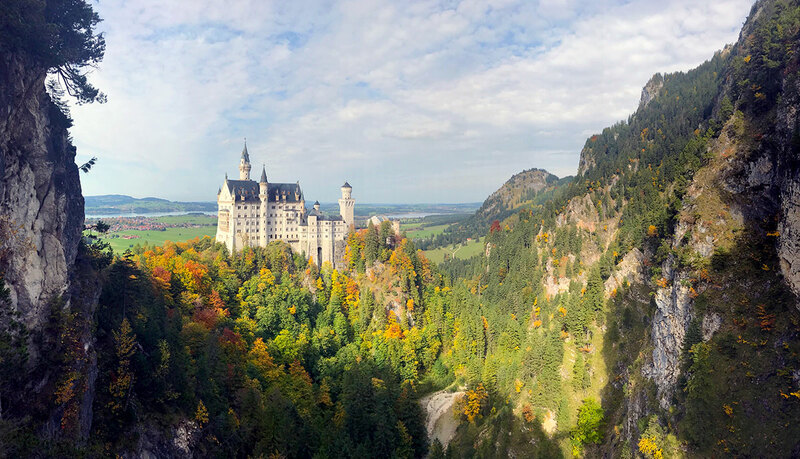 You’ll depart to Neuschwanstein Castle from Munich via a luxury coach bus to the beautiful Algäu region of southwestern Bavaria to the charming town of Hohenschwangau, near the Austrian border. It’s a great way to see the picturesque Alpine villages of southern Bavaria, and get a backstory on the history of the castle. Bike tour in the meadows below Neuschwanstein Castle. 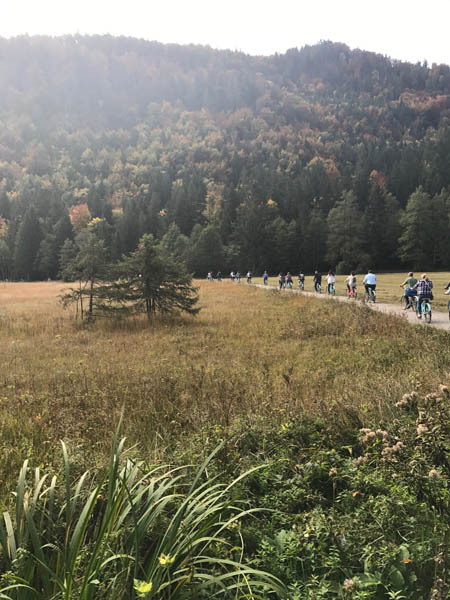 Once arriving in the town of Hohenschwangau you will embark on a beautiful bike ride of the Bavarian countryside, and learn about the area surrounding Neuschwanstein. Alternatively, you may choose to walk through town and absorb the sights, or even double up and add on another castle – Hohenschwangau Castle. This castle was actually where King Ludwig II grew up, and is another highly rated castle. The castle is an architecture masterpiece, but the grounds and area surrounding the castle are almost more stunning than the interior. Imagine a beautiful fairy tale forest tucked into the foothills of the alps with a flowing river, mountain trails, and breathtaking views of distant lakes and Alpine villages. The Throne Hall of Neuschwanstein Castle. There is a spectacular view around every corner, including the incredible surroundings while on Mary’s Bridge, where the famous photos are shot. 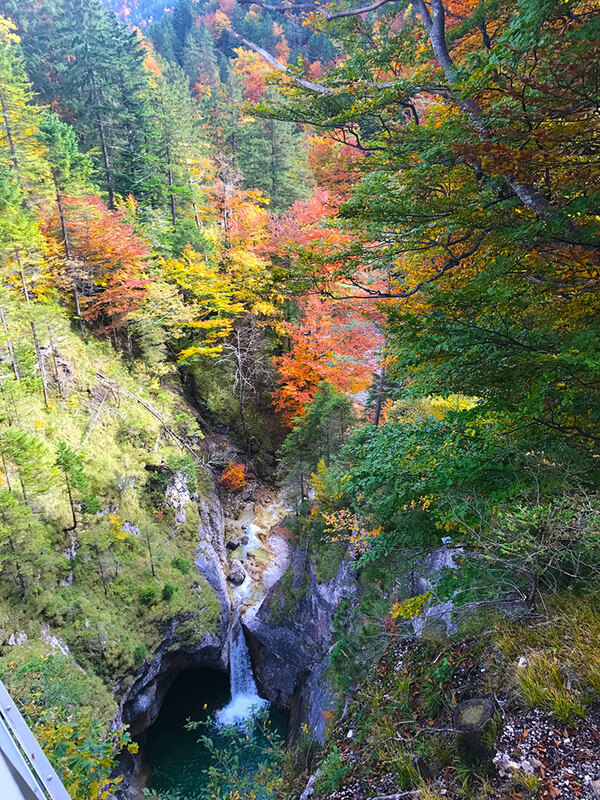 There are also hiking trails leading into the Alps that generate visions of Hansel and Gretel in the forest. 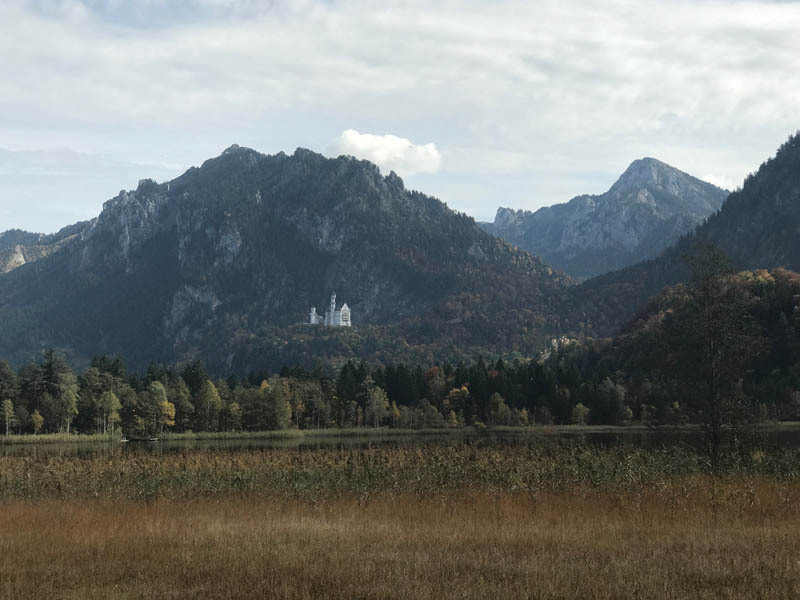 National Geographic lists Neuschwanstein as one of it’s top castles in Europe, and Conde Nest Traveler made mention of the masterpiece in June of 2017. We detailed it in our post on the most famous castles in Germany – it’s a must-see. Want to check out the Oktoberfest brochure?